« Wow, it’s been a busy year! As mentioned in a previous post, this has been a very busy geocaching year for us. We’re working on three challenges that have helped with this. The first of these started in April, when we began to work on filling our calendar. In order to do this, we need to find a geocache on every day of the year. 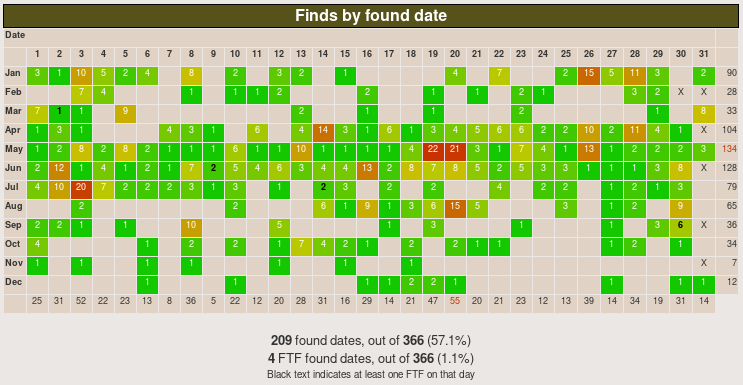 It doesn’t mean we need to go on a streak and find a cache every day in a row, but checking our finds grid to see the empty days and try and find a cache on those. So far we’re up to 209 days out of 366, and should be able to keep it up for a couple more months. I think we’ll find it more challenging towards the end of the year when the weather starts to warm up – it makes it more uncomfortable for us and also more comfortable for the snakes. The second challenge we’ve set ourselves is to try and fill in our “Finds by hidden month” chart. This is also known as the Jasmer challenge, and to complete it you need to find a cache that was hidden in every month since geocaching began in May 2000. For some of the older months, there aren’t any caches in Australia that were placed during those months, so the alternative Ausmer challenge has been developed instead. Even though there are fewer months in this version (it’s only from January 2001 onwards), we still probably won’t be completing this challenge. We’ll do our best to fill in as many of the months as we can, though. The third challenge involves finding a special type of geocache. Find out more in an upcoming post. Tagged Geocaching, notGLAM. Bookmark the permalink.